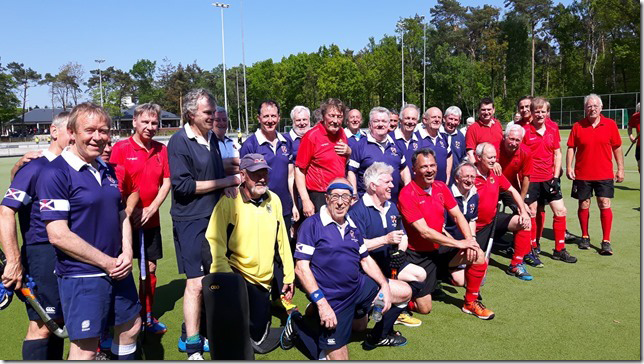 Scottish Thistles returned to Tilburg for the third time to take part in the 3rd International Veterans Hockey Tournament. With the dispensation of the organisers, they brought a squad of sixteen players to play in the 60-67 section, in which ten teams competed. Graham Conkie, Donald Dunbar, Ian Dunbar, Chris Kalman (vice cpt and gk), Tim Lorimer, Ian McCreath, Neil Mackenzie (cpt), Mike McInally, John Michalik, Alan Parker, Keith Raper, Stuart Robertson, John Smith, Stuart Stephen, Tony Walker, Neil Ward. There were ten teams in the 60+ tournament, playing in two pools on the Friday and Saturday, two matches each day. 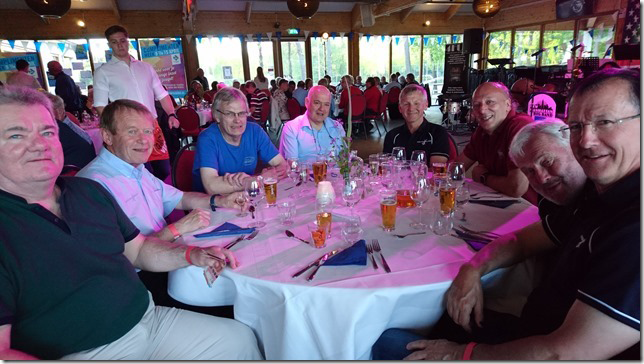 Scottish Thistles were in 60+ Pool G with Dutch NHC 60B, Dutch NHC 65B, Germany Men A and Voordaan.The teams in Pool H were Dutch NHC 65A, Dutch NHC 70A, Dutch Old Masters, Ireland Over 55 and Italy Men 60+. Matches lasted 30 minutes. The weather was a tad warm for northern folk but an ample baptism for the upcoming tournament in Barcelona. After the customary warm welcome to all from the host clubs officials the Thistles got underway with a game against the Dutch side Voordaan. The team gelled well considering it usually takes a couple of games to hit their stride, eventually achieving a 0 : 0 result against the strong Dutch side. It was agreed that although the squad was not the one travelling to Barcelona there were enough who were to try a number of position combinations and substitution strategies in preparation for the World Cup. The results, in terms of positives, indicate an improvement in limiting high score losses but there were still some hairy moments that need to be worked on. Ultimately the Thistle team spirit and ethos survived to be carried into Saturday evening's entertainment. 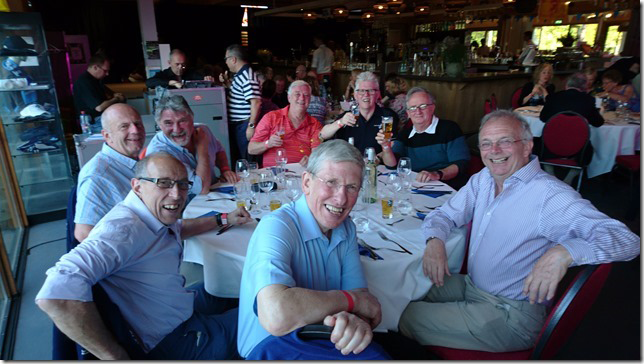 This year's tournament dinner was as enjoyable as the previous year but surpassed last year's in one respect, in that the entertainment was excellent with a highly entertaining combination of vocals from a group of four young ladies supported by a band of 15 + musicians. Their hearty renditions of World War II favourites, delivered with the ladies in uniforms of the period, even enticed some within the Thistles team to take to the dance floor. As a demonstration of the range of evening activities, on the Friday, a semi formal meeting of the full team undertook to thrash out views and opinions on the way forward for the Thistles given the proposed changes at world level that may impact on tourist trophy teams. Mike McInally agreed to take on the role of minute taker to report back to the Scotland LX club. After a restrained evening by the team on Saturday they took to the field on Sunday for the final two matches. Although remaining consistent in respect of the previous days' scores, the final game, albeit against a much younger Irish Over 55 team, seriously tested the cohesion of the Thistles squad but they stuck to the task till the end. The preparations for the World Cup now move on to Bedford for two games against an Irish Over 60 team on 19/20 May.